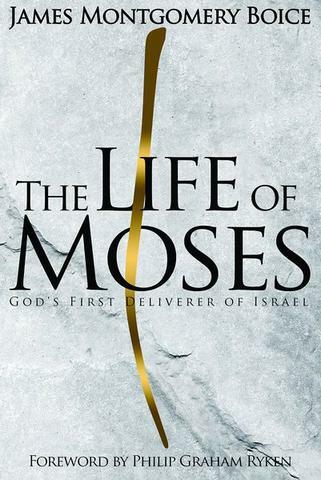 The Life of Moses: God’s First Deliverer of Israel, by James Montgomery Boice. P&R, 2018. Hardcover, 472 pages, $22.50. Reviewed by OP pastor Andrew Miller. Hebrews 3 draws our attention to Moses who was “faithful in all God’s house” (3:2) and who pointed to Jesus whose ministry would be even more glorious. The posthumously published book The Life of Moses: God’s First Deliverer of Israel, explores the faithfulness of Moses in order to show us God’s faithfulness and grace to his people. Drawn from sermons by the late Dr. Boice, the book tracks the life of Moses through each book, starting with Exodus and ending with the final words of Moses at the conclusion of Deuteronomy. Each chapter explains a passage of the Bible, sometimes even a series of biblical chapters, and makes application to the Christian life. While some chapters reference connections to the gospel more explicitly than others, Boice’s insistence on proclaiming Christ and the Bible as one grand story of redemption comes out clearly. For example, Boice explains that Leviticus is at the center of “the five books of Moses” to emphasize “that the sacrifices stand at the very heart of the Old Testament … They also point to the very heart of Christianity, because all the sacrifices are fulfilled and brought to completion by Jesus Christ. And his death on the cross stands at the very heart of Christianity. So as we come to Leviticus, we come to the very heart of the meaning of the Christian faith” (224). The weaknesses of the book are minor, and some of them may be due to its genre and to the nature of a posthumously published work. For example, there are places where additional Scripture references would have been helpful to support an assertion. As in mathematics, there are times when you need to “show your work” to convince readers or give them the ability for further study. At the same time, The Life of Moses is more of a devotional work than an academic commentary. Similarly, a survey of four large books of the Bible is bound to skip over some details. Much more could have been said about Moses being prohibited from entering the Promised Land because of his sin. Likewise, the covenant that bears the name of Moses, the “Mosaic Covenant,” is left largely unexplored. These points aside, The Life of Moses is informative and edifying, and I plan to integrate some of what I learned into my own teaching. I happily recommend The Life of Moses for readers who wish to learn about Moses or the books of Exodus, Leviticus, Numbers, and Deuteronomy. It has enough depth to inform pastors and stimulate their thinking, while being clear and accessible enough that new Christians will find it a very profitable introduction.